Formula one racing is high speed, power, and the flavor of the international jet set. 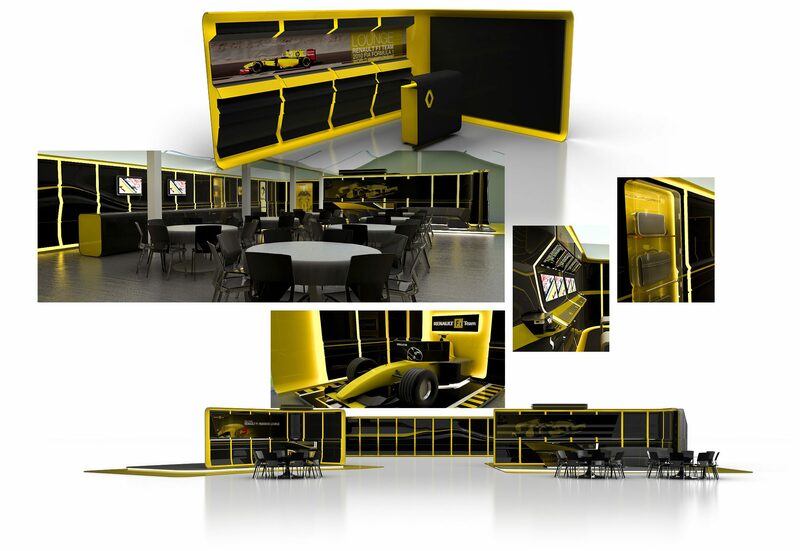 When we were asked by Kohlbecker architects to come up with a design for Renault’s Paddock Lounge our engines howled and our creative wheels started spinning. Transferring speed, aerodynamics and power to an architectural concept, flexible enough to freight easily worldwide, was a perfect challenge and an inspiring task for us. It was clear from the beginning that the shapes of the cars would be the starting point for our approach. Lines and curves translated into inspiring forms and assembled into easy to handle modular structure. Looking at the first renderings we were quite sure we were on the right track. What followed was detailed work on all the functional and media elements to provide guests with the best possible Renault formula one experience. When we received the first panels we knew, with a smile on our faces, that Paddocks Lounge was now ready to start.